Khalid Shaikh Mohammed, the suspected mastermind of the Sept. 11 terror attacks, was arrested Saturday in one of the biggest catches yet in the war on terrorism, Pakistani officials said. Mohammed, perhaps the most senior al Qaeda operative after Osama bin Laden and Egyptian Ayman al-Zawahiri, was one of three people arrested in a raid in Rawalpindi, near the Pakistani capital of Islamabad, said Pakistani Information Minister Sheikh Rashid Ahmed. The raid was the work of both U.S. and Pakistani agents, according to U.S. and Pakistani officials who requested anonymity. His arrest is a major coup in the effort to stifle al Qaeda. Mohammed, who is on the FBI most wanted list, had a hand in many of the terror organization's most notorious attacks in recent years. "That's fantastic!" President Bush said early Saturday when his national security adviser, Condoleezza Rice, delivered the news of Khalid Shaikh Mohammed's capture in Pakistan. "It's hard to overstate how significant this is," White House spokesman Ari Fleischer said. "It's a wonderful blow to inflict on al Qaeda." Pakistan has handed other al-Qaida suspects over to the United States but officials here would not say whether that was the plan this time. Military officials in the United States also would not comment on whether Mohammed would be turned over to the United States or another country. Mohammed has not been charged in the Sept. 11 attacks, but he has been charged in a 1995 plot to blow up 11 passenger planes on their way from Asia to the United States. The U.S. government was offering up to $25 million for information leading to his capture. CBS News correspondent Mark Knoller reports that Mohammed is also suspected of orchestrating new threats against the US that were a factor in raising the threat level last month. Mohammed, who was educated in North Carolina and speaks perfect English, is expected to undergo a long and thorough interrogation, reports CBS News correspondent Jim Stewart. There's potentially much to be learned, says Stewart: It was Muhammed who plotted with his nephew Ramzi Yousef - the man who first tried to blow up the World Trade Center in 1993 - to plant bombs aboard the U.S. aircraft in Asia. It was Muhammed, officials believe, who later dreamed up the idea of crashing hijacked jets into the World Trade Center. It was Muhammed who approved the selection of the 9-11 hijackers, Muhammed who signed off on a rash of bombings in Asia and the Middle East after 9-11, and Muhammed who knows the who, what, where and when of most future Al Qaeda plans. The idea, Stewart says, will be to simply try to stop those plans "dead in their tracks." Milt Beardon, formerly with the CIA, told Stewart, "In many ways I would think Americans might be safer today because we have him than if we had Bin Laden himself." The question now, adds Stewart, is, "What does Muhammed know about the whereabouts of his boss? He may know plenty." But it's also likely that Osama Bin Laden listens to the news as well, U.S officials suggest to Stewart, and - in their words - "has probably already packed his bags." Because Mohammed could be "an enormous potential intelligence asset, says CBS News consultant Andrew Cohen, "It's hard for me to think that US intelligence and miltiary officials are going to be rushing to turn him over to law enforcement officials so he can stand trial. It's much more likely that he'll be put on ice for a while, interrogated, and then perhaps tried before a secret military tribunal." "Mohammed is a prime candidate to be the first person tried before such a tribunal. He seems to fit all of the legal criteria for that process," Cohen continued. Tom Roger, head of the group Families Of September 11th, told CBS News, Radio the arrest "gives us some comfort. I think we want to feel that ultimately we're going to round up all these rats, chase them out of their holes and bring them to justice." The tip-off came about a week earlier following a raid in the southwestern town of Quetta and the arrest of a Middle Eastern man, possibly of Egyptian origin, according to a Pakistani government source who spoke to the AP on condition of anonymity. "At the time of that raid in Quetta the authorities were looking for Khalid Shaikh but he escaped and from there they followed him to Rawalpindi," said the official. "They got information from the man they picked up in Quetta and from phone calls until they tracked him down to Rawalpindi." U.S. officials regard Mohammed as a key al Qaeda lieutenant and organizer of the terror mission that sent hijacked passenger jets crashing into the World Trade Center, the Pentagon and into a field in the U.S. state of Pennsylvania, killing more than 3,000 people. Mohammed was arrested along with a second man of Middle Eastern origin and a Pakistani, Ahmed Abdul Qadoos, 42, a member of one of the country's best organized and well established religious parties, Jamaat-e-Islami. The identity of the Middle Eastern man has not been revealed. Senior government officials said the three men were arrested about 3 a.m. local time Saturday at a house where Qadoos lives with his father. But Omar Qadoos, Ahmed's cousin, said only Ahmed, his wife and two children were in the house. There also was a guard outside, he said. "The police pounded on the gate and then they rushed through. There was some firing, but no one was hurt and then they beat the guard and broke the lock on the front door," Omar Qadoos said. He said police held the family at gunpoint while they collected cassettes, a computer and computer discs, leaving the floor littered with clothes, papers and other items. Jamaat-e-Islami, said Qadoos was one of its members and that he had no links to al Qaeda or any other terrorist organization. Local Jamaat-e-Islami leaders Mian Mohammed Aslam and Hanif Abbasi said at a news conference Saturday in Rawalpindi that Qadoos was wrongly arrested. They said the FBI conducted the raid and carried out the arrest. A spokesman at the U.S. Embassy said he didn't know whether the FBI was involved but added on condition of anonymity: "We do have excellent cooperation with the Pakistanis. We provide technical assistance, but they conduct their own arrests." "The Pakistani agencies have been at work tracking these people," Ahmad said. He said Qadoos was "picked up because of his association with al Qaeda." Pakistani President Gen. Pervez Musharraf has been an important ally in the U.S.-led war on terror, but has said that only a small number of FBI agents are operating in Pakistan and only to provide intelligence on suspected al Qaeda or Taliban fugitives from neighboring Afghanistan. However, Pakistani police and intelligence officials say FBI agents have been involved in nearly every important terror arrest in Pakistan since the war on terrorism began. The Pakistani government says it has handed over more than 420 al Qaeda and Taliban suspects to U.S. custody. Until now the biggest catch so far was the arrest last March of al Qaeda's suspected financier, Abu Zubaydah, who was taken into custody in a raid in the central Pakistani city of Faisalabad. Abu Zubaydah, a Saudi-born Palestinian, was said to be a link between bin Laden and many of al Qaeda's operational cells. Abu Zubaydah ran the Khalden camp in Afghanistan, where U.S. investigators believe many of the Sept. 11 hijackers trained. On Sept. 11, 2002, Ramzi Binalshibh, a would-be hijacker who couldn't get into the United States, was captured in the southern port city of Karachi. 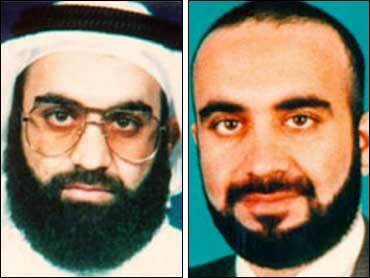 He became an aide to Mohammed and a key moneyman for the attacks. Binalshibh was also the former roommate of hijacker Mohamed Atta.